So Ron Diamond his touring animation show to SCAD this year, and it was pretty amazing. Some of the shorts this year included Presto, Pixar's new short which expectedly got the most favorable reaction, probably because every person there had already seen it at least once. Glago's Guest, from director Chris Williams (who is responsible for Disney's upcoming "Bolt") was a fine example of what is going on in mainstream animation today. I was kind of surprised to see this and Presto there, however, because of Diamond's personal mission to spread independent animation to those that may not be able to see it otherwise. And in his own words, he didn't put this show together to pander to those that may not know or like animation- it's for those in animation who want to see what's new. There were some gems, and some that I felt were a little flat. The show opened with Keith Reynolds Can't Make it Tonight. This was an uproariously funny narration to stick figures. This was followed with La Maison en Petits Cubes, a story about one old man trying to survive and remember in a completely flooded world. One entitled Kudan featured a blockheaded father in some bizarre world trying to save his son (there's much more, but it would literally be impossible to explain this one without seeing it). It was honestly a bit too weird even for me. There were three rather funny shorts- Hot Seat, a story about bunnies in an office trying not to get stuck with a broken chair (it was basically Dilbert with bunnies), A Mouse Tale, a run-in between a mouse and a lion with an unexpected ending, and KJFG #5, the short that ended the show. This was the simplest, but one of the funniest shorts about a trio of forest critters in a band. The most interesting came with Franz Kafka's Country Doctor, created by Koji Yamamura. This was a bizarre and rather confusing story, with some outrageous animation. I loved Yamamura's Mt. Head, and I think I could really like this one too, I just need to see it again- and not when I'm really tired and have a terrible headache. During the credits there was considerable chatter about this one, indicating some liked it and some hated it. I haven't made up my mind yet. By far my favorite was Skheizein. This short was about a man who is hit with a meteorite and is transplanted 91 centimeters from himself. It's ambiguous as to whether it's just his perspective that's changed, or whether other people see him detached from himself as well. I thought it was just about his perspective being off. This was fascinating, both funny and tragic. On a whole it was a rather enjoyable show. I kinda wish I was feeling better during it. Oh well, I hope to see some of these again. So for this assignment we had to shoot something, then animate a character into it. Depending on how well the animation goes, I'll render out some shadows and composite those in as well (definitely at least if I use it for my reel), and mask out the rope I used to pull the chair. But here's a pretty rough version of the animation. Still a long way to go. For my final I expanded on my first project- fine tuning it, adding facial, and adding the second character. This is easily the most complicated animation I've done thus far. I'm pretty happy with it. Whew, wish me luck. Tomorrow I have my preliminary review (my first of many reviews). Pretty much says, "yes you can continue on the program" or "no, we don't want you here." I figured I could put up the clip I was trying to emulate. Since I'm only putting this up as a reference, I don't think it'll cause any problems. Like I Said before, it's from the Rocko's Modern Life Pilot episode. And here's my final project. There's still a few things I could tweak- and there's really no facial on there. If I ever decide to use this for a reel (I doubt I will) I'll go back and fix that stuff. This is the second 3D cartoon assignment. For those of you that know Rocko's Modern life I took a clip of Spunky eating the green stuff out of the garbage from the pilot episode. Really cute clip. Anyway, this is adapted with some pretty heavy modifications from the source. It was surprisingly difficult to take something with really limited animation into a 3D environment. I haven't done much tweaking in the graph editor yet. This is pretty close to finished, but a couple more days work is needed. I forgot to post this when I finished it. It's a piece of dialog from Taylor Mead in the closing scene from Coffee and Cigarettes. I wanted to do something really subtle and introspective. Interestingly, this was perhaps the most difficult thing I've had to animate thus far. 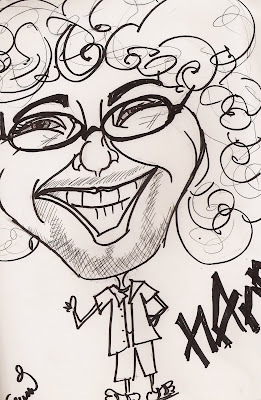 This is a lovely caricature of me by Sammi Dougherty. If you don't know what I look like, this is pretty much the spitting image. Well, here's blocking 1 for my next acting piece. The assignment is to have a character come in with one emotion, look inside a box (or in my case just see it), and have the emotion change. I'm not going to tell you what the emotions are, because I want to know if the story reads from just the gestures. I'm not terribly happy with this pass. I think a lot of the poses are stiff and kind of ugly. So I'm revamping a lot of it in blocking 2, which is due Tuesday. So let me know if you think this reads okay. This is the end result of the backflip I was blocking in my previous posts. It's not flawless- meaning not quite demo reel quality- but it's close. I just need to push the weight right and left a tad more, and I may have made his arms a little too loose. One of the comments I got was that they looked like wet noodles, so I may have to dial that back a smidge. I absolutely adore Animusic. If you don't know what it is, just look it up Youtube, or go to their website. It's just some wonderfully imaginative animation set to music. They have some software that takes the music and converts it into keys for their animation. Since music plays a major role in my creative process, I was inspired by them, so I did a little thing myself. I didn't really know how to do this, so I just had to develop my own technique. The water droplets are all particles, so I had to time up when they hit the strings, and trace back how long it takes them to fall and key their generation. It's only 20 seconds, but I'm hoping to go back and do the full piece. I'm in my first real character animation class right now, and I'm just starting to really learn about blocking. After only doing it for a few weeks, I think it's the bees knees. I have a couple playblasts of blocking 1 with just the bare minimum of important key poses. Then with blocking 2 I started adding the breakdowns, and anticipation, as well as trying to introduce some drag. Keep in mind I'm only just beginning to grasp this process. I've had a blog for a while now with movie reviews, but I've decided to start a personal one. I'm an animation graduate student working on my MFA at the Savannah College of Art and Design, and I figured I'd start this to keep a record of my goings on. As the title suggests, animation is nothing but complete madness, and anybody who wants spend their lives doing it is nuts. Of course, I'd never want to do anything else. Hope you enjoy.